As turboprop and jet aircraft climb or descend under certain atmospheric conditions, they can inadvertently seed mid-level clouds and cause narrow bands of snow or rain to develop and fall to the ground, new research finds. Through this seeding process, they leave behind odd-shaped holes or channels in the clouds, which have long fascinated the public. Heymsfield and Kennedy went back through data from their aircraft’s forward- and downward-viewing camera. 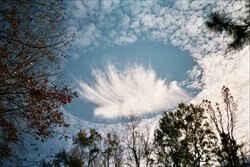 They noticed a hole in an otherwise solid deck of altocumulus clouds in the forward imagery, as well as a burst of snow that extended to the ground. The cloud layers outside Denver contained supercooled droplet—particles of water that remain liquid even at temperatures as low as -35 degrees Fahrenheit (about -34 degrees C). When a turboprop plane flies through such a cloud layer, the tips of its propellers can cause the air to rapidly expand. As the air expands, it cools and causes the supercooled droplets to freeze into ice particles and fall out of the clouds as snow or rain.